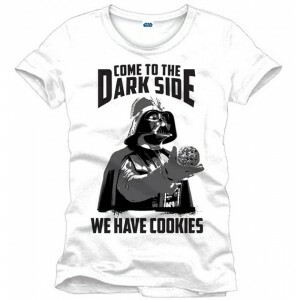 Darth Vader says it best : come to the dark side, they have cookies ! Clearly there's not much of a choice thanks to this awesome white Darth Vader cookies t-shirt. Si vous choisissez de recevoir votre "Darth vader t-shirt : Come To The Dark Side White" via Lettre Suivi, les frais de ports seront seulement de 2,95 € ! Votre Darth vader t-shirt : Come To The Dark Side White est en stock ! Commandez aujourd'hui et recevez cet article entre le 25 et le 26 Avril (livraison via Colissimo ou lettre suivie).